You probably know the mantra for using social tools at this point – engage, engage, engage. Simply setting up a social media presence and updating it regularly is just not enough. It’s what you do there that matters. If you build it they will come, but this is social media and it's how you interact and handle the community that will make them stay. Be clear in letting people know what you have to offer. Don't be shy and explain exactly why they should check you out. Mention in your profile section what people will get from your page or why they should fan or follow you. Take Twin Cities-based Frattallone's Ace Hardware, their Twitter page clearly shows their followers that "Mike Frattallone, the 'Hardware Store Guy' has answers to your questions about projects, products and, yes problems." Keep your audience on their toes by keeping things fresh. @Frattallone's tweets helpful tips like when it's time to start indoor tomato plants and by posting links to handy how-to videos on their YouTube channel. A key way the store shows their customers their appreciation is by posting links to downloadable coupons and specials. When people take the time to comment or even upload a photo on your page, let them know you are paying attention; reward them. Show your community the best of what they have contributed by highlighting best comments on a regular basis. This shows your audience that you are interested in what they're doing and that you appreciate their activity. 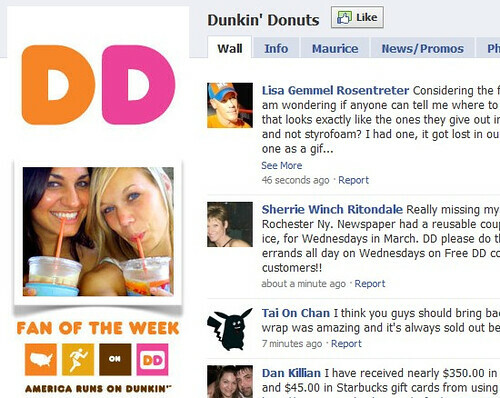 Dunkin Donuts does a great job of letting their fans know how much they care with their Fan of the Week photo that runs on their Facebook Fan Page. What makes it work so well is that fans must post a photo to the Fan Page in order to be in the running. Photos are curated and the winning photo changes every week, with the new content keeping fans coming back for more. Of course it's much better to give than to receive, so give your audience something in return. After all, the social Web is a two-way conversation. Don’t keep asking for feedback without giving back. Matilda Boland, who runs social media for the Sunburnt Cow, a New York-based restaurant and bar, posted an announcement and promotion flier on its Facebook Fan Page about the April 1 opening of their new Sunburnt Calf location. Then on opening day, she posted a status update reminding fans that at 4 p.m. the free food and drinks would start flowing to celebrate the new opening. A few days after the grand opening, she posted a link from their website to a photo album of those who were there for the party. Boland said their Facebook and Twitter pages are almost like having a club membership without the pretentiousness. “I think it’s a way for people to be a part of something,” she said. Show customers how your business really works in action. Have you dazzled your customers by pulling out all the stops to help them solve a particularly challenging problem? This is more than just a customer testimonial. Don't be afraid to brag about how awesome you are. Go through all the steps you took to make sure your customer was satisfied. One way you can do this is by explaining what the problem was, what steps you took to solve it, what the solution was, and how the customer reacted. Make sure you highlight your mini-case study on your blog, website and social media pages. JetBlue Airways is an example of a company that has made use of their Twitter account to satisfy their customers. Morgan Johnston, manager of corporate communications for JetBlue Airways said one of the goals with their Twitter account @JetBlue is to maintain the conversation, understand the customer base and provide customers with what they’re asking for. In July, the company launched @JetBlueCheeps, tweeting about special deals because customers were asking for it. Try starting a conversation and then back off, trust your customers to continue it among themselves. Think about what you do best. Are there specific products, events or promotions at your business that your customers go wild for? Try to build the conversation around them. JetBlue’s Johnston said they were seeing people engage with each other during the "All You Can Jet" promotion and using the #AYCJ Twitter hashtag. “The most enjoyment we’ve seen is customers start to engage with each other without our assistance,” he said. “From a very transparent level, it’s easier for us for customers to engage with each other.” They do this by having a JetBlue voice direct the conversation and when they can promote a hashtag, it helps their community find each other. Keep in mind that community engagement is more than expecting participants to give you content for free. There are thousands of companies vying for their time and attention, and you have to show them you're listening by taking action based on their feedback.